It was frustrating because it made me feel like I had to offer a better discount and give up my commission to get this sale or customer. In the beginning I would offer to do that. After a while though I realized that was not really a good idea for my business and my reputation in the long run. There are times when you are in a crunch to meet a minimum, reach a sales goal or earn an incentive and offering a discount may help you reach that sale. You may also have very loyal, repeat customers that you offer free shipping to in appreciation for their continued business. I offered discounts and specials from time to time myself. I think there has to be a fine line between how, when and how often you offer discounts to customers though. 2. It makes it look like you do not believe in the value of the products that you represent. 3. It makes your customers believe the products are overpriced and not worth the investment. 4. It will make your customers wait to purchase only when you are holding a big sale, which will create an ugly cycle for your business. 5. It undercuts other consultants (which is also against your company’s policy). 6. It means you don’t make as much commission or possibly any profit from the sale. 7. It makes other consultants feel like they have to compete by also offering discounts or a better deal than the next consultant just to get business. You obviously love the products and believe they are valuable, otherwise you would not have signed up to be a consultant. 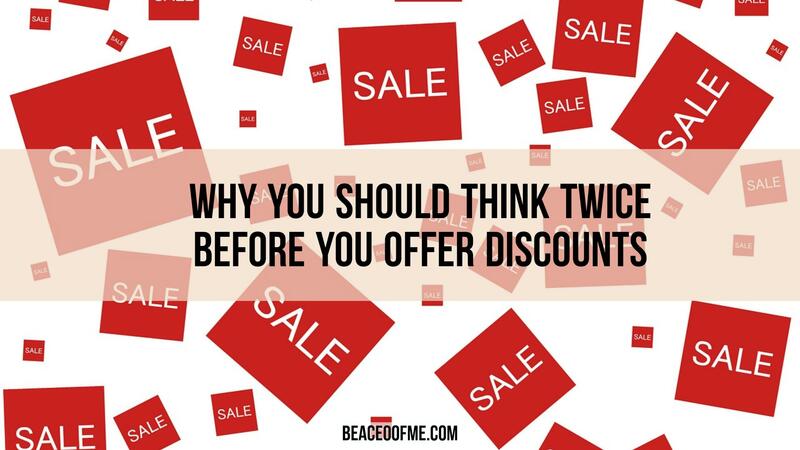 Stop offering discounts and making your customers think your products are not worth the price. Most all direct sales companies have products on special each month. In the company I represented, all of our full-time catalog products go on sale for 15-75% off at some point throughout the year. Use those sales specials to your advantage instead of offering your own deals. As a direct sales consultant you have 3 price points to offer your customers: full price, half price or free! Customers always have the opportunity to get their products for free or half price by hosting a home, catalog or online party. Be sure to mention that when a customer talks about the price being too high or asks for a special deal. Believe it or not, not everyone knows about the host programs we offer. They also probably do not realize that they can do a catalog or online party either. Do not let customers pressure you into offering a better deal than someone else. If all they want is the best deal, by all means let them go with the person willing to give up their commission. You deserve to be paid for your work! You are not a big box store so you cannot afford to price match. You do not need to compete with any other consultants or try to offer a better deal just to get business. Not every customer is looking for the best deal, many of them are looking for the best service! Offer excellent customer service and you will build loyal customers who will continue to do business with you in spite of better offers from other consultants. Obviously the choice on whether or not you offer discounts is up to you and I don’t judge anyone who does this. I do hope you will consider these reasons and really think about your long term goals and reputation before you decide to make discounting a habit. What are your thoughts on this topic? I would love for you to leave a comment below and share this post. Thank you! i completely agree with this article! I always love your point of views!! Thanks for the reminder- this is so true! We do deserve to be paid all that we’re worth we have to be mindful of all of the points you’ve mentioned! That’s great advice. I tried several different direct sales businesses over the years (Tupperware included) and would promote the items that were marked on sale by the company and would offer small discounts to repeat customers. I forgot to say that some customers aren’t loyal and will go to the next consultant that offers a discount. I found that when I started discounting, it made me uncomfortable asking full price later. It became what everyone expected. I really tied my own hands! Not good. I won’t make that mistake again. Well written. You hit everything. The only time I offer a “personal” discount is on vintage product (no longer available) that remains in my inventory and taking up space. I never discount it for less than what it cost me (factoring commission earned and shipping cost) since I need to at least break even. These vintage items are only offered once a year at my Holiday Open House so they have to come to see what’s there. If it remains in inventory after 3 yrs then it is included in a raffle prize donation to a 501c3 so I can claim it on my taxes (with proper documentation from 501c3).